When’s the last time you visited the Partner Center? We have added several new marketing materials in the Partner Center, available now, to help your credit union promote the value of Sprint to your members. Effective May 18, 2018, there was an update to the Sprint Credit Union Member Cash Rewards offer. All of the Sprint, the League and All Bundle Marketing Materials have now been updated in the Partner Center. For more details on the Sprint offer update, please check out the Sprint offer information hub. The Sprint "Summer Of Hundreds" Campaign materials are available in the Partner Center under “Summer of Hundreds Campaign.” This campaign will run until June 30. Second quarter is almost over but it is not too late to send your members an email. Be sure to utilize new updated materials to let your members know about the Sprint Credit Union Member Cash Rewards program! Forward your Q2 Sprint marketing documentation to ClientSupport@cusolutionsgroup.com by July 13. Summer is here! 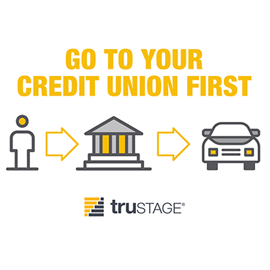 Before your members take a road trip this summer, make sure they stop by your credit union to learn how they may be eligible to save hundreds on auto and home insurance from the TruStage Auto & Home Insurance program. With the TruStage Auto & Home Insurance Program from your credit union, members can protect what they love, and travel with piece of mind. Members can click here to get a free quote or by calling 800-789-6286. The TruStage Auto & Home Insurance Program is built specifically for credit union members and aligns with your values, empowering your credit union to better meet members’ needs. Your credit union earns royalties for all TruStage Auto & Home Insurance Program policies purchased by your members through the Love My Credit Union Rewards program. Free, turnkey marketing materials help you communicate the benefits of the TruStage Auto & Home Insurance Program to your members. The TruStage Auto & Home Insurance Program is also included in the All Bundle. Not participating in Love My Credit Union Rewards? Visit the Partner Center to learn more and enroll today! There’s never been a better time for credit union members to switch to Sprint! For a limited time, they can get four lines for $25 each with the fifth line free, with Hulu. If they bring or buy their phone they can get one month free! * Plus, this deal can be combined with the Sprint Credit Union Member offer of $100 cash rewards for each new line, up to three lines. Credit unions, mark your calendars! Sprint will be hosting another “Sprint Saturday” event on Saturday, June 23. This is a great opportunity to partner with your local Sprint store on a day when more people will be stopping into the store. In-store at this event, your members can take advantage of two great offers, 50% off Samsung Galaxy S9 with Sprint Flex Lease plus, $50 when they bring their number to Sprint! ** As always, these promotions are stackable with Sprint Credit Union Member Cash Rewards. A flyer and web banners are now available in the Partner Center to promote the “Sprint Saturday” event. Social media assets will soon be available. If you want to partner with a local Sprint store for this event or another event, please submit your request here. *After one time $60 credit applied within 2 bills. Req. eligible BYOD or full-price phone, new account with one new line of service and AutoPay. **Phone Offer: Limited time offer. Galaxy S9: $16.50/mo. after $16.50/mo. credit applied within two bills. Galaxy S9+: $21.50/mo. after $16.50/mo. credit applied within two bills. For well-qualified customers with 18-mo. lease and new lines of service. Early termination results in remaining balance due. $50 Offer: Friday thru Sunday 6/22 thru 6/24 only! Limited time offer. Requires a new line of service and number port in from current carrier. Via Visa® Prepaid Card after online registration. Register by 7/23/18. Register online at sprint.com/offers. For participating credit unions, partnering with your local Sprint store is a great way to generate local awareness about the program while potentially growing membership. In May, Wanigas Credit Union, located in Michigan, joined a local Sprint store to promote their credit union and the Sprint Credit Union Member Cash Rewards program. Wanigas Credit Union gained 11 loan/membership leads from the one-day local partnership and are working on contacting these leads in the weeks following the event. Pictured: Christa Willoughby, Wanigas CU MSR/Loan Officer and Anne Alderton, Wanigas CU Assistant Branch Manager. The upcoming Sprint Saturday event on Saturday, June 23 is an ideal opportunity to partner with your local Sprint store. To partner with a local Sprint store, simply fill out a request form in the Sprint Marketing Materials section of the Partner Center under “Local Sprint Partnerships.” If your credit union has already participated in a local Sprint partnership, please send your photos and feedback on the experience to ClientSupport@CUSolutionsGroup.com. The 2017 tax season has come to a close, but taxes may still be top of mind for your members. Congress has passed the largest tax reform legislation in more than three decade. The bill will affect most taxpayers, so it’s never too early to educate your members on these changes. Visit the Partner Center in the upcoming months for some great educational content with up-to-date information from our partner, TurboTax. If you are concerned about how these changes will affect your members, don’t worry. TurboTax will be up to date with the latest laws. Plus, if your members have more questions when filing their taxes, they can connect via TurboTax Live to speak with a CPA or enrolled agent to answer their questions. Don’t leave your members in the dark, visit the Partner Center for more information on the TurboTax credit union member discount program or to enroll for next tax season. Click here to read the full TurboTax article on 2017 Tax Reform Legislation. Love My Credit Union® Rewards sends email summaries like this to keep you up to date.